The Chiang Mai Municipality organized free health screening for elderly in the city recently at the Municipal Offices. Nurses and health professionals were on hand to screen for eye and hearing tests, blood pressure, BMI and other basic health tests. Nurses are seen here taking the blood pressure of elderly residents who visited the facility over 4 days of free tests. (Photo courtesy of the Chiang Mai Municipality). The Government of Japan, under its Grant Assistance for Grassroots Human Security Projects Scheme (GGP), is providing funds amounting to 3,563,000 baht for “The Project for the Improvement of Medical Referral Systems and Health Services in Mountainous Areas in Maelanoi District, Mae Hong Son Province”. 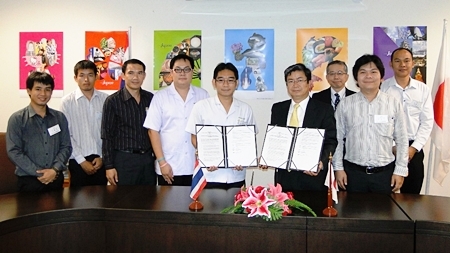 On July 16, 2012, Mr. Kazuo Shibata, Consul-General of Japan in Chiang Mai, and Dr. Thossaphol Ditsiri, Director of Maelanoi Hospital, jointly signed a funding contract for the project at the Consulate-General of Japan in Chiang Mai. Universal healthcare coverage in Thailand has allowed many people to access basic medical treatment more easily and free of charge. However, the regional disparity in terms of opportunities for medical treatment has become more prominent. Maelanoi Hospital, which is the only government hospital in Maelanoi District, covers 35,000 people in Maelanoi District, which borders Myanmar and surrounding areas in Mae Hong Son Province. 90% of the area comprises of rugged mountains and 80% of the residents are ethnic minorities such as Karen and Lawa. Since many roads in these mountainous areas are unpaved, and transportation and communication to villages are limited, it is difficult to transport patients to hospitals quickly in emergency cases. In addition, for people living in such remote areas, it is not easy to access health and medical services. In order that more people can access the services, Maelanoi Hospital has provided regular mobile clinic services which include dentistry and prenatal checkup, targeted at remote and mountainous villages. However, vehicles and equipment in good condition, which are highly necessary and frequently used for emergency transport, emergency life saving, and local health services, are currently lacking at the hospital. In response to a request from Maelanoi Hospital, the Government of Japan has decided to provide funds for a 4WD ambulance and a 4WD pick-up truck for the mobile clinic service, able to run on unpaved mountain roads, a transportable ultrasound system for prenatal checkup, and a defibrillator for emergency life saving. Chiang Mai students and the Municipalty joined together on July 31, 2012 to plant trees in honor of the 60th birthday of HRH Crown Prince Maha Vajiralongkorn which was on July 28. 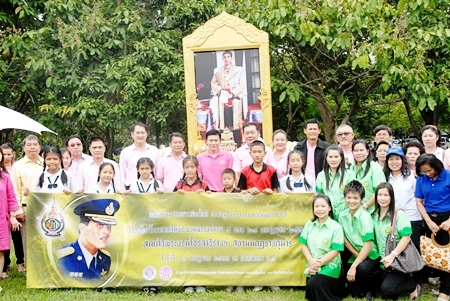 Celebrations in honor of his birthday were also held at the Chiang Mai University Convention Center where government officials joined together to honor his birthday. Chiang Mai Mayor Tussanai Buranupakorn lights candles at Wat Chiang Yuan in preparation for the start of Buddhist Lent. Asarnha Bucha Day recognized as the day that the Buddha gave his first sermon and his birth, falls on August 2 this year. Both August 2 and 3, the start of Buddhist Lent, are considered two of the most holy days in the Buddhist calendar and are public government holidays. The Buddhist Holy Day of Asarnha Bucha falls on the 15th night (15 kham) of the full moon during the eighth month of the Buddhist Lunar calendar. Asarnha Bucha Day on August 2 is worshipped because of three important events occurring on the day; called the “Triple Gem” the Buddha, Dharma and Sangha. These commemorate, firstly, the first sermon given by the Buddha, called the “Dharmachakapavattama Sutta” concerning the “Four Noble Truths” presented to the Buddha’s first five disciples. Secondly, the day is considered to mark the birth of Buddhism and thirdly, it is considered the day the Sangha was established. On this day, the first person listened to the Buddha’s sermon, realising the truths contained therein and became the first Buddhist monk. This created the Buddhist order “Sangha” and the day is known as “Sangha Day” as well as Asarnha Bucha Day. The Thai government established the observance of Asarnha Bucha Day in 1958. Buddhist temples throughout the Kingdom arrange ceremonies venerating the important historic events in the past. Devout Buddhists participate in the ceremonies by presenting offerings to monks, listening to sermons and performing ritual prayers. The entire day is revered and certain precepts are adhered to by the more devout Buddhist, and by those who have the inclination and opportunity to do so. The Wientian ritual ceremony is performed in the evening as many go to nearby temples bringing candles, flowers and joss sticks, completing three trips walking around the temple area sacred grounds. Khao Pansa falls on the first full moon (1 kham) of the Buddhist Lunar calendar during the eighth month of every year, which this year equates to August 3, and ends on the 15th full moon (15 kham) of the 11th month of the Buddhist calendar, usually in October. During a leap year it is identified during the second eighth month. The term “Khao Pansaa” can also translate to entering the months of the rainy season when monks return to the temple for the duration of the rains, usually to the temple where they were ordained. They stay there for approximately three months. The monks are not supposed to leave the temple, or stay overnight at any other location during the months of rain. Although the rainy season is considered to be longer than three months, lasting up to four or even more, monks are only required to remain at the temples for three of the four months. During the last period of the rainy season they can then go elsewhere when the “Katin” ceremony is performed. The Katin ceremony sees followers of Buddhism all over Thailand attending temples in the morning, bringing food, necessity items, money, the traditional candles, garments and ceremonial items for the monks, with flowers and candles in hand. 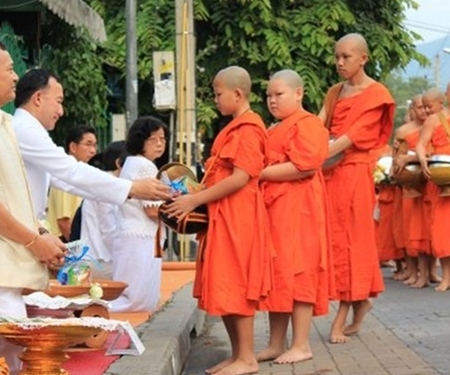 For those people having devout faith they may refrain from the recognised eight offences for the duration of the three month rainy season just as monks do, while others may give up a single vice, with yet others recognising the 5-8 offences for the day. Many people take time away from their work on Khao Pansaa to recognise the importance of the Buddhist Holy Day. Everyone is invited to participate in the temple ceremonies and to refrain from offensive behaviour for the day, and to make the same effort thereafter. These two holy days are no alcohol days and bars, restaurants and stores will refrain from selling alcohol on the 2nd and 3rd. Mr. and Mrs. Kumahata were awarded a certificate in recognition of their efforts to promote Japanese language and culture in Chiang Mai by Japanese Consul-General Kazuo Shibata. 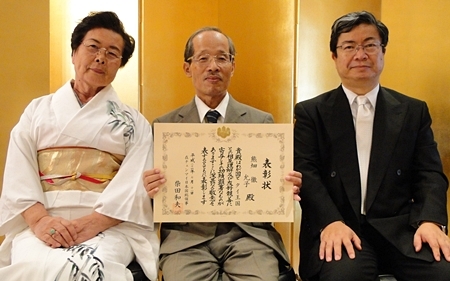 The couple were recognized for their work in promoting Japanese culture and language through Japanese language programs and cultural activities to teach Chiang Mai people more about Japan. The couple formed a teaching club called “Assistance for Japanese Education in Northern Thailand” or AJENT where they teach the Japanese language but also calligraphy, Shodo and many other traditional Japanese arts. The Chiang Mai Municipality continues its prevention campaign in city nursery schools to fight hand, foot and mouth disease outbreaks among the toddlers who attend the schools operated by the Municipality. The Public Health Office is conducting classes for the children to learn to wash their hands and providing antibacterial wipes for schools. There have been over 500 reported cases in Chiang Mai Province, according to Emerging Infectious Diseases Bureau director and Disease Control Department spokesman Dr Rungruang Kitpati these are neither new strains nor mutations of the disease that primarily hits children under the age of 12 and particularly those under the age of 5 years old. The number of patients has reached almost 14,000 and July and August are considered the peak contagious months, doctors have warned parents not to panic but if their child has a fever to keep them from going to school to prevent the spread of the disease. Teachers are being urged to report any children with rashes on their hands or mouth as this is one of the symptoms. 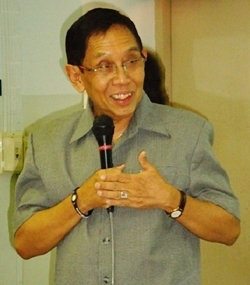 Professor Dr. Aung Tun Thet, Senior Advisor to the UN Resident Coordinator in Myanmar, spoke on Friday July 13, 2012 to an international audience at Payap University’s International College about Myanmar’s reform and doing business in Myanmar. Professor Dr. Aung Tun Thet talks about the future of business in Myanmar. The professor also added that while Myanmar is open for business, they are careful about who they do business with. Labor reforms and corporate social responsibility (CSR) are concerns the Burmese government is considering in their bid to attract foreign direct investment (FDI). The country is looking into allowing 100% foreign ownership of business within its borders; however, the details of this have not yet been released. Myanmar’s large working age population, untapped natural resources, their strategic location between China and India, access to international sea and air ports, and friendly demeanor to FDI as well as educational reforms will hopefully transform the country from a least developed country to a developed country during the 21st century. On the most auspicious occasion of the 60th Birthday of HRH Crown Prince Maha Vajiralongkorn the Chiang Mai Mail would like to join the Kingdom in offering our heartfelt wishes for a most happy birthday. 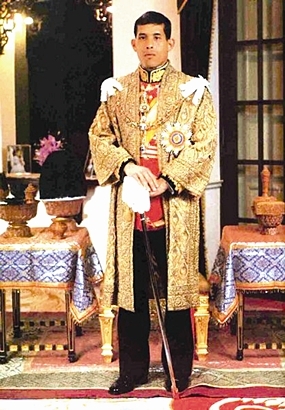 HRH Crown Prince Maha Vajiralongkorn was born on July 28, 1952, in the Ambara Villa of the Royal Dusit Palace in Bangkok, the second of four children, and the only son of Their Majesties King Bhumibol Adulyadej the Great and Queen Sirikit. His Majesty King Bhumibol Adulyadej conferred his son with the title of ‘Somdech Phra Borama Orasadhiraj Chao Fah Maha Vajiralongkorn Sayam Makutrajakuman’ on December 28, 1972, making him the Crown Prince and Heir to the throne. The Crown Prince has continued the Royal Family’s assistance programmes in underdeveloped areas around the country and visited depressed urban areas around Bangkok distributing food and necessities to people in need. He has been active in support of the country’s great agricultural pursuits. HRH Crown Prince Vajiralongkorn and Mom Srirasmi Mahidol are the proud parents of HRH Prince Dipangkorn Rasmijoti, born on April 29 at 6:35 p.m. at Sriraj Hospital in Bangkok. It is the couple’s first child. Chiang Mai Mail joins the people of Thailand to humbly wish Her Royal Highness Princess Soamsawalee a very Happy Birthday Friday, July 13. 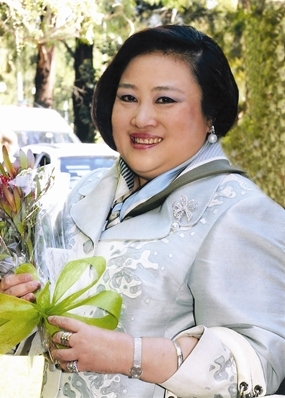 The Chiang Mai Mail would like to join the Thai nation in wishing HRH Princess Soamsawali a very happy 55th birthday which she celebrated on July 13, 2012. The Princess is very active in many Red Cross programs for children who have been affected by HIV/AIDS. She was commended by the UNAIDS Executive Director Michel Sidibé for her “tireless dedication, commitment and leadership” in the country’s HIV response and presented HRH with a plaque for her ongoing efforts to prevent mother-to-child transmission of HIV. Her tireless dedication to this cause for the past 25 years has ensured that many children have received the help and medication they needed. 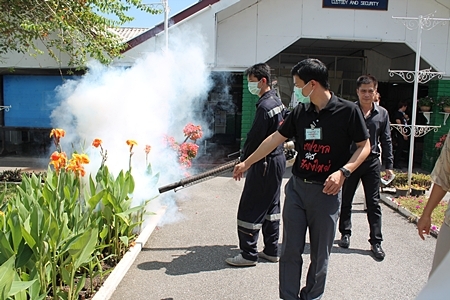 The Municipality has begun spraying around temples, schools and public areas to reduce dengue fever mosquitoes. (Photo courtesy of Chiang Mai Municipality). As the rainy season starts up in earnest the numbers of dengue fever cases reported in the city continue to rise Mayor Tussanai Buranupakorn reported to the Chiang Mai Mail in a recent interview. Dengue fever is on the rise nationwide with the Department of Public Health reporting over 17 000 cases of dengue fever this year with 18 deaths, a higher rate of infection than the same time last year and affecting more adults than children. A campaign has been launched at schools to remind students that dengue mosquitoes breed in even the smallest pool of water, so to dump the water out of any buckets, cups, potted plants, in fact anything that can hold water. Also to teach that mosquitoes bite in the day time, so people must use mosquito repellent even in the daytime, although the Mayor pointed out they had found mosquitoes with the dengue virus out at 8 p.m. “They are adapting, so we must be careful,” he noted. Dr. Atthapol Cheepsattayakorn, Deputy Director of the Office of Disease Prevention and Control 10 Chiang Mai, said that the 8 Northern Provinces had 511 reported cases of dengue fever with no deaths reported from January to June 30, 2012. Phrae had the highest infection rate followed by Nan, Lampang, Mae Hong Son, Chiang Rai, Phayao, Chiang Mai and Lamphun, respectively. He noted that the main concern was to minimize the number of patients, with education and prevention by spraying around schools, temples and community areas, was to reduce the breeding grounds of mosquito larvae, Chiang Mai can help fight dengue. He added that while the mosquito born disease Chikungunya has been spreading in the South there has only been only one reported case in Chiang Mai, a few months ago. Dengue fever is characterized by a high fever, rash, painful joints, and severe headaches. It is also known as “Breakbone fever” because patients report severe pain in the bones and joints, as if they were breaking. Normally lasting 2-7 days, the disease is characterized by a high fever, 40 C (104 F). In some the disease can proceed to critical resulting in internal and external bleeding and fluid in the lungs. Patients who begin to bleed or who feel severely ill should go to the hospital immediately. The number of cases in Chiang Mai currently stands at 97 year to date. The number of reports of dengue fever begin to rise in June; June saw 45 cases reported in the city, while by the 16th of July there were 38 reported cases and the numbers are expect to peak in August. Ton Pao in San Kamphaeng District held the first Chula Kite fighting competition in the North this month. This is the first event of its kind in the North, previous competitions have been held in the South, Central and Isaan regions of Thailand. The Mayor of Ton Pao Municipality Supakhin Wongsa presided over the opening of the kite competition that showed off the “Chula kite” made popular by HM King Rama V with the first contest for a royal gold cup was held at the Dusit Palace in 1906. Kite flying and kite fighting competitions have been popular in Thailand for centuries with even HM King Rama II reported as flying kites competitively. This ancient sport involves fighting between the male “Chula Kite” and the female “Pakpao Kite” with teams battling their kites out in the sky. “Everyone should work together to encourage children to learn the arts of Thai culture and the ancient sport kite flying.” He noted that kite flying and kite fighting is now internationally popular as well and hopes to hold further competitions in the Municipality in the future. Chiang Mai will be hosting the 41st National Games in December and has been given a budget of 51 million Baht for maintenance at the 700 Year Stadium as well as other budgetary needs. Deputy Chiang Mai Governor Ritthipong Techaphan chaired the meeting of the Organizing Committee of the 41st “Chiang Mai Games” that approved the budget Initially, each party submitted to the Board of Directors budgets totaling over 79 million Baht but under scrutiny by the Board it was determined that 51 million would be sufficient for everyone’s needs. The Board also issued a progress report on the upcoming Games as well as determining pay practices, eliminating duplication among the departments and ensuring the efficient use of funds. Chiang Mai was chosen by the Sports Authority of Thailand to host the 41st Annual National Games from December 9 to 19, 2012 at the 700 Year Stadium and other sports fields as needed. The owners and managers of over 150 liquor stores, nightclubs, bars and karaoke bars met with Chiang Mai Governor M.L. Panadda Diskul in early July to sign an agreement to enforce certain regulations in their facilities including underage drinking, fire safety, and closing times. Secretary of Chiang Mai Adisorn Kamnerdsiri, Muang District Chief Chaiyasith Rattana-Chaisit and the heads of four police stations as well as relevant departments also attended the meeting at the Muang District Office on July 3, 2012. The District Chief signed a Memorandum of Understanding with the owners to enforce laws and regulations in 8 specific areas including underage drinking, underage servers, weapons, drugs, closing times, fire exits and fire safety, as well as to keep staff off the sidewalks from calling out to customers so as to maintain the cultural beauty of Chiang Mai. The Governor noted that it is his responsibility to ensure that the laws are enforced and that the safety of the community is maintained. He said that the owners must be strict in the matter of drugs in their venues and that staff in bars must be over the age 20. He noted that it had been discovered students would hide their uniforms in their bags so as to go drinking so ID checks should be enforced. He also informed the bar owners that they must check for weapons as they endangered the lives of residents and tourists, noting that Chiang Mai did not want a repeat of the recent attacks in Phuket. He also noted that they should heed their neighbors’ complaints about noise and closing times. There had been complaints in the moat area around Loi Kroh, on Chang Moi Road, JJ Market area, Santitham and Nimmanhaemin areas of noise and of drunken people disturbing the area with shouting and urinating in public. He concluded that Chiang Mai is not like Pattaya or Phuket, that tourists come here for the beauty and history of Chiang Mai culture and nature and that the laws need to be strictly enforced. The first Skal Club to be established in mainland China has been officially approved by the Chinese government authorities. Skal International Beijing has been officially formed with both Chinese Nationals and Non Chinese Nationals as individual members. It is the first tourism non-government organization with individual members to be officially sanctioned by the government of the People’s Republic of China. Enrique Quesada, President of Skal International, said he looked forward to the formal inauguration of the new Skal Club. “The Executive Committee of Skal International was delighted to approve the first Skal Club in mainland China and looks forward to welcoming many new Skal members from China into the Skal organization.” Mr. Quesada said. Skal International was established in 1934 and is a professional organization of tourism leaders from around the world, promoting global tourism and friendship. Skal International has approximately 18,000 members in 450 Clubs throughout 87 nations. It is the only international group uniting all branches of the travel and tourism industry. Its members, the industry’s managers and executives, meet at local, national, regional and international levels to discuss and pursue topics of common interest. “China is the world’s largest burgeoning tourism destination and the establishment of a Skal Club in mainland China will open enormous opportunities for the travel industry to do business in China, both inbound and outbound, and I look forward to seeing what the future holds. I have no doubt there will be significant membership growth of Skal International in China”, said Mr Quesada. The inaugural meeting of Skal International Beijing will be held at the Beijing Asia Hotel in Beijing on Wednesday 15th August, 2012 at 4.00pm. The Governor of Chiang Mai, M.L. 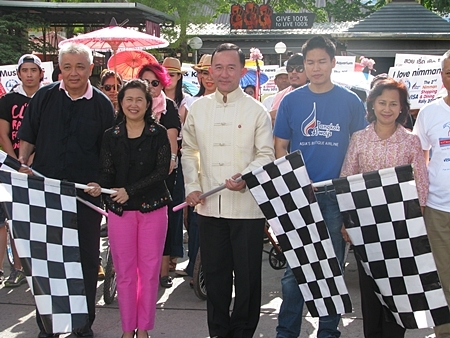 Panadda Diskul is joined by TAT Deputy Governor for Marketing Mrs. Juthaporn Rerngronasa and others in waving the starting flag to launch the shopping rally. 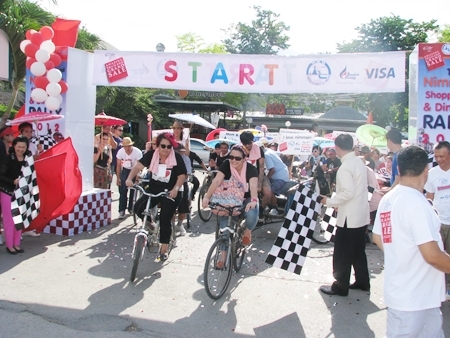 The Tourism Authority of Thailand (TAT), Visa and Bangkok Air joined with Nimmanhaemin Road businesses to hold the 2nd Annual Shopping & Dining Rally. Chiang Mai Governor M.L. Panadda Diskul was joined by TAT Deputy Governor for Marketing Mrs. Juthaporn Rerngronasa, TAT Chiang Mai head Chalermsak Suranont and the head of the Bangkok Air office in Chiang Mai to open the event on Saturday, July 7, 2012. 30 teams of 90 people joined in the competition, each with 1000 baht to find certain items. Prizes included tickets to Koh Samui, Bangkok, and the Maldives as well as other awards from sponsors dusitD2 Chiang Mai, Centara Duangtawan Hotel and from Central Pattana Co. Ltd. Prizes were valued at over 100,000 Baht. The TAT Deputy Governor said the success of the Nimman Shopping & Dining Rally in conjunction with the Amazing Thailand Grand sale campaign shows the support of businesses. TAT sponsored the activities of this fun and colorful event for the second year. Shoppers surged out of the gate at Warm Up Café to start the rally. at the Royal Rajapruek Park from August 9-31, 2012. 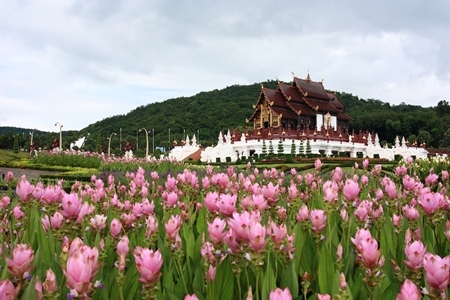 The Highland Research and Development Organization will be holding the annual Siam Tulip Festival from August 9-31, 2012 at the Royal Rajapruek Park in honor of HM the King’s 85th birthday as well as the 80th birthday of HM the Queen and the 60th birthday of HRH the Crown Prince. The Curcuma is also known as the Siam Tulip or the Blooming Krachiao. The event is held to promote the flower in the North, which has the largest fields of curcuma. The fields of Pa Hin Ngam National Park and the surrounding area are covered with the pinkish-purple flowers of the Siam Tulip. There will be competitions for best flower, exhibitions, and specially decorated gardens using curcumas, as well as academic seminars on the plant. In the annual Skytrax World Airline Survey global survey conducted by London-based aviation consultants Skytrax, almost 19 million travelers polled worldwide chose AirAsia as the World’s Best Low Cost Airline for the fourth consecutive year. AirAsia came out tops in the independent survey that measures airlines’ product and service standards as well. AirAsia’s Group Chief Executive Officer, Tan Sri Tony Fernandes was present to receive this prestigious award held at Farnborough International Airshow in London, United Kingdom on 12th July 2012. AirAsia was also named Best Low Cost Airline – Asia, for the fourth consecutive year as well in the same award ceremony. 500 students fell ill from salmonella infected eggs donated by a parent. More than 500 students fell ill on the morning of July 9, 2012 after eating boiled eggs donated to the Suksa Songkroh School in Mae Rim District by a parent in a merit making attempt. Students with the severest symptoms were sent to area hospitals while the rest of the students were housed in a temporary field hospital inside the school auditorium. Chiang Mai Governor M.L. Panadda Diskul and Dr. Wattana Kanchanakamol Chief of the Chiang Mai Public Health Office visited the school to offer students and parents their encouragement. 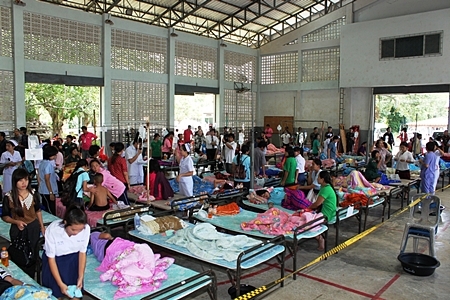 The Chiang Mai Public Health Office reported that 127 patients were admitted to hospital with severe symptoms and septicemia at 9 different hospitals; Kawila Base camp Hospital, San Sai Hospital, Doi Saket Hospital, Hang Dong Hospital, Maharaj Nakorn Chiang Mai Hospital, Dara Rasami Hospital, San Kamphaeng Hospital, Mae Tang Hospital and Nakorn Ping Hospital. Dr.Wattana Kanchanakamol said that the symptoms included vomiting, diarrhea, a high fever and low blood pressure. One 17-year-old schoolgirl suffered from shock due to severe septicaemia and low blood pressure. The Governor noted that the eggs had been boiled several days before being served and that while the parent meant well that food that is not fresh should not be donated or served. He noted that this should serve as very serious lesson for everyone on the importance of food safety and that all schools in the 25 Districts of Chiang Mai Province had been instructed to put in place a policy to ensure food safety and cleanliness in the cafeterias. Dr Wattana Kanchanamol said lab tests confirmed that the diarrhea had been caused by a drug resistant strain of Salmonella bacteria; the resistance is due to antibiotics being mixed in chicken feed. He added that the donor family had boiled the eggs several days before and had not refrigerated them before delivering them to the school for dinner. Some of the eggs also went to other agencies and one student from the Northern School for the Blind fell ill before they could be informed to discard all the eggs. The doctors warn that the students could suffer relapses or infect others as they will be carrying the bacteria for 3 more months. Authorities insist the eggs did not hit the general markets in Chiang Mai but did warn consumers to make sure that their eggs are properly cooked and refrigerated. Niranont Inmongkol points to the costumes and jewelry that he had stolen from Love Code Studio on Wua Lai Road. Love Code Studio on Wua Lai Road reported to police on June 30, 2012 that their shop had been burgled at 3 a.m. The plate glass window had been smashed and 12 Thai wedding dresses and costumes had been snatched from the shop. 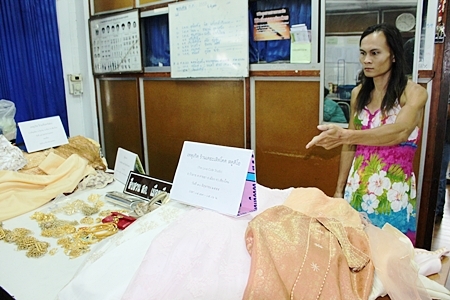 The dresses were valued at 120,000 Baht. CCTV footage showed a ladyboy breaking into the shop and stealing the dresses. Police stopped Niranont Inmongkol, age 35 of Phayao Province, on a JRD motorbike at Tha Pae Road near the Chiang Mai Commercial College on July 3, 2012. He confessed to police after a search of his home yielded 29 Thai costumes as well as accessories such as necklaces, earrings and belts that he had broken into the building and stolen the clothes. Additionally, he confessed that he had broken into Chan Song Wedding Shop on Charoen Muang Road and had stolen clothes and items valued at more than 450,000 Baht. He told police that he planned on selling the clothes to a Cabaret show that travelled from Pattaya every year to perform in Chiang Mai. Saraphi police were called to the MS Village in Saraphi District on July 6, at 9:30 p.m. by a relative of one of the victims after he found the couple dead at their residence. The 47 year old husband, Thai national Ampol Sathatu, was found dead with a gunshot to his head while his French wife, Sereve Jordano, also age 47, was found nearby with gunshot to the left side of her head. A gun was found under the bed. Police investigation did not show any sign of robbery or of any trespass into the house. Pol. Col Yuthana Kanchan, Superintendent of the Saraphi Police said that neighbors reported the couple had moved into the house several years before and money problems had caused the married couple of 20 years to argue regularly. Police believe that Ampol shot his wife and then himself as his money problems drove him to suicide. Police will continue to investigate to determine the reason behind the deaths. Soldiers from the Pha Muang Task Force were involved in a shootout near the Myanmar border in Doi Pha Mee in Mae Sai District of Chiang Rai in the early morning hours of July 16, 2012, leaving 7 men dead. The National Police Chief Pol. Gen. Preawpan Damapong was joined by the Police Region 5 Commander Pol. Lt. Gen. Suthep Dejraksa and the Director of the Office of Narcotics Control Board (ONCB) Vichai Chaimongkol visited the village of Doi Pha Mee in Tambon Wiang Pang Kam in Mae Sai district at 8 a.m. on July 16 to view the scene. Members of the Pha Muang Task Force and police were patrolling the area opposite Tachilek in Mynamar after they had received reports that armed groups were transporting drugs into Thailand. Around 4 a.m. the officers came upon a drug trafficking caravan of more than 15 people coming up a steep ridge. The police called on the group to halt but they opened fire on the police and the Thai forces returned fire. Many members of the group escaped into the forest but they left behind 7 bodies along with 70 kg of crystal methamphetamine or Ya Ice and 550,000 methamphetamine tablets (Yaba) worth over 100 million baht as well as several AK47’s and 9 mm weapons with ammunition. The police believe that the armed groups come from the Wa and they have been hired to protect Akha people carrying the drugs over the border into Thailand. 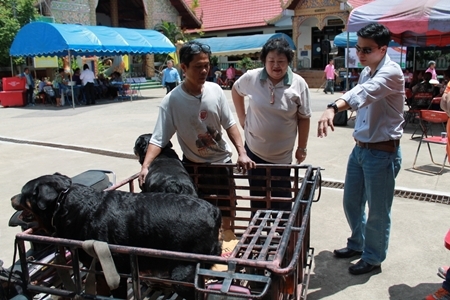 As part of the city’s ongoing efforts to provide residents with services, the mobile unit visited residents of Chiang Mai on Saturday, July 7 from 9 a.m. providing health services including dental checks, rabies vaccinations, contraception for dogs and cats, distribution of chemicals against mosquitoes, haircuts, legal services and social services. This is part of the Municipality’s ongoing public service project to provide services for the working members of Chiang Mai city. Here two women bring in their dogs for free rabies vaccinations as part of the city’s bid to vaccinate both pets and temple dogs around the city to reduce the incidence of rabies. Chiang Mai Governor M.L. Panadda Diskul is seen here offering alms to novice monks near Wat Phra Singh. In the ongoing celebration of the 2600 years celebration of the enlightenment of Buddha and in honor of HM the King’s 84th birthday, Buddhist monks travel along well-known routes for people to offer alms and make merit. The event is sponsored by the Chiang Mai Chamber of Commerce and the Tourism Association of the North for Chiang Mai. Sundays they will be at the Kruba Srivichai Monument from 6 a.m. to 7:30 a.m. Mondays the monks of Wat Phra Singh walk from the temple to Chiang Mai Gate from 6 a.m. to 7 a.m.
Saturdays they walk from Wat Chetupon near the Prince Royals College across the Rattanakosin Bridge and back from 6:30 a.m. to 8 a.m.
Somchai Sienglai, Secretary of the Ministry of Culture awards students who participate a shot film project. The College of Arts, Media and Technology (CAMT) at Chiang Mai University, the Ministry of Culture and the Thai Red Cross Society held a short film project for secondary school students in the North. The project was held from May 17-20 where students were taught short film techniques by CMU film students. 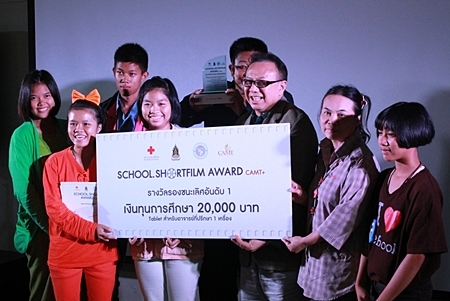 The secondary students then submitted their short films for competition on Jul 7, 2012. Dr.Noppasith Jakpithak, Assistant CMU President for Academic Affairs said that the current culture and way of life threatens the rich culture of the past. One of the reasons for this is the lack of interest in the media to offer stories that are interesting and yet promote social values. This project offered students the opportunity to develop their creativity and further develop social values through the medium of film. Somchai Sienglai, the Permanent Secretary of the Ministry of Culture said that the agency is the voice of the government and is responsible for promoting the film and video industry. That offering students choices allows them to avoid drugs, and other activities that troubled children with no outside opportunities often face. The project offers the students skills for the future and develops their minds offering a lifelong lesson that is good for the future of the country.